Revolutionizing the cab service patterns in the country and providing a breakthrough innovation buzz in the industry by introducing the bike taxi service module. Launched by the leading cab service providers themselves, the bike taxi services have gained immense success in congested and tick-on-clock cities like Bangalore and Mumbai. 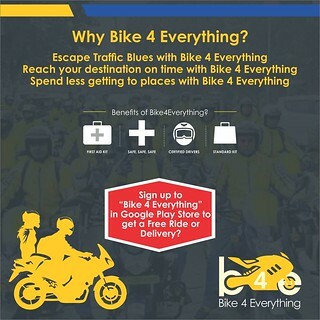 One such service that operates in the mid-Indian continent and has popularized through in past year is Bike4Everything, which is a two-wheeler service provider serving commuters to travel down within the Indore and Bhopal region on an instant demand. It allows ride services with the skilled bike riders assuring trouble-free travelling and lets the users get through with the app with a lucid UI to just upload the pickup and drop points and commute with reasonable charges. For individuals requesting or ordering an on-demand service, Bike 4 Everything is looking to create an array of bike taxis- something that can be described as the “Vehicle for all purposes”, attempting a sort of online-offline integration in almost all possible verticals. Bike4Everything doesn’t just provide services for commute. It even provides the customers with delivery options where they can easily receive their ordered food, groceries, laundry, medical aids or couriers via the bike4everything mobile app. The causes and consequences of hitch-hiking get reduced to a maximum and reaching anywhere on time is no more a worry. Single travelers have a better option to commute reducing upon the travel costs so as to optimize travel options. Bike4Everthing completely understands that as technology gets better, people’s interest change and manufacturers need to keep up with the current trends. It offers the company to launch new two-wheeler models directly on road, generating both publicity and profit for each of the two companies involved. In order to serve the surge in on demand transportation, Bike 4 Everything aims to create an inventory of bikes. To complement the assemblage of bikes, it also proposes a partnership where one could contribute an array of two-wheelers which would in turn be inducted into service following routine checks. The firm offers you to turn your bike into a money machine. With the liberty to drive anytime and anywhere, part-time model is ideal for youngsters and people who want to cash in on the buzzing on demand market. 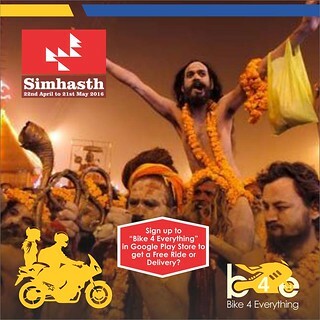 With literally no competition at present and heavy traffic congestions all over hi-tech cities, Bike 4 Everything aims to accumulate a large partner installed base. With innovating marketing strategies, the firm expects to thrive on the real time bike booking app. With a monopoly in two wheeler taxis, a large customer base is ensured.